Now, detailed descriptions of the new release may be easily found in the network (you just need to google a bit to find plenty of them), so here I note only some impressions of use. Say, what strikes me without “scratching” too much under the surface, in the first approach. for a “sick” of social networks like myself, Ubuntu 10.04 comes with a really interesting aspect: it is eminently social. It comes with the client gwibber (now at release 2.30.0.1) that supports Twitter, StatusNet, Facebook, Identi.ca, Digg, FriendFeed, and also Qaiku (a microblog service with an exciting support for languages; I like it a lot and, as a matter of fact, I have realized most of the interface translation in Italian). To tell the truth, not only it’s included, but it result deeply integrated in the “social” concept of Ubuntu, for which we can now express our “online presence” directly from the top status bar of Gnome. I am very curious (and so are the developers) to understand whether the inclusion of native Qaiku in Ubuntu will bring more users to put their noses in this interesting but still little known platform. There was much discussion on Ubuntu related sites, concerning the new network online music store that comes integrated into Rhytmbox, the “software and music playback for GNOME”, which is now reached its version 0.12.8 (but what to say about this habit of going forward with the zero point something ?). I just spent a bit of time in it, and I found that the prices of a number of albums are very interesting and – at least in some cases – significantly lower than their iTunes counterparts . Even the ‘Ubuntu Software Center’ (again, the not-too-hidden reference not is to the online software repository of Mac OS X) has made significant progress. Browsing through categories to choose the software to install it ‘s now easier, and it is a truly enjoyable experience … and it’s free, too! Overhall, I like Ubuntu 10.04. Surely there are things to improve and fix (for example, during the first days of use I stumbled upon some oddity of gwibber, which kept to give me authentication error in Qaiku, despite having already added the correct API at least a couple of times …), anyway I think we came to a really respectable version. One of the most important representations – perhaps the most important at present – of an open source operating system. … what do you think, I’m exaggerating? I’m not sure if it’s already well known, in the community of Ubuntu lowers. Anyway, I just discovered it today: namely, the Firefox default page in the next release of Ubuntu (10.04, code name “Lucid Lynx”) is already online, and it features a search box that it’s not more provided by Google, but instead by Yahoo! No more brown in Ubuntu desktop? Anyway, I must recognize that the posted screenshots are pretty…. It seems that Ubuntu is succesfully shaping a path toward a “clear” and fresh new style. The new layout let you understand that there is something “new”, without loosing completely the old and widely accepted look & feel. Well done Ubuntu! 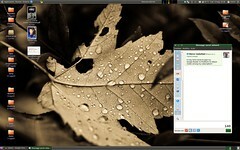 Posted on March 3, 2010 Categories branding, linux, UbuntuLeave a comment on New Brand for Ubuntu? Interesting comparison between the expected features of the upcoming operating releases from Microsoft and Ubuntu.